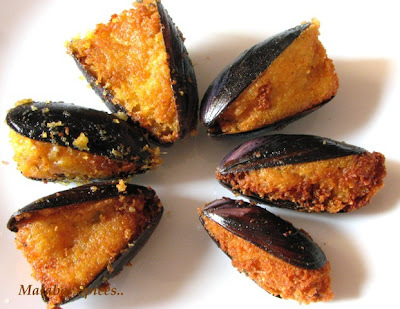 So most of you familiar with Malabar cuisine have already guessed correctly what the kadukka or kallumakai or mussels ended up as..It is Kadukka Nirachathu or Arikadukka as some call it is a very popular snack in the Malabar region. Arikadukka are Mussels stuffed with a mixture of ground raw rice paste, shallots and spices and then steamed and fried with the shell on. This is a much sought after item on the "salkaram"(party) as well as Ramadan menu. 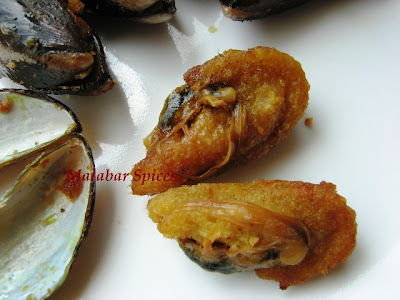 Some separate the mussels after steaming and then dip then in a batter of rice flour and spices and then fry then but we prefer to fry the mussels with the shell intact. It adds to the fun of peeling and eating them as if they were pistas or groundnuts and inhibits the wary guests. These beauties are from Kerala.. The name itself conjures up the image of large batches of the delicacy being made by my mom and my aunts all sitting in the open kitchen facing the backyard. from making the filling to cleaning the mussels to frying then, this is definitely a group activity made easier by all the gossip and laughter that flies around. 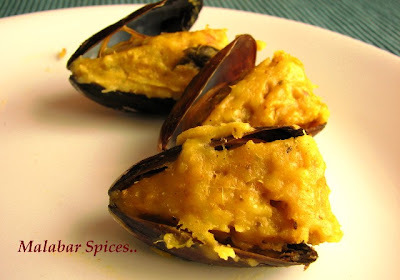 Kadukka or mussels are easily available in Northern Kerala and is used in a multitude of recipes...curries with plantains, mangoes, fried, and made into spicy gravies. 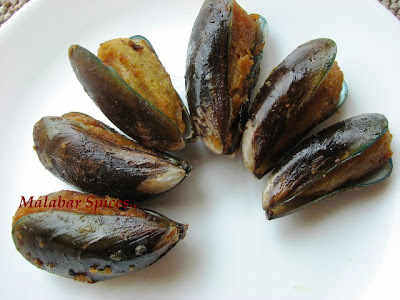 But the taste and texture of mussels is showcased wonderfully best in this delicacy. In Kozhikode, we get our yummy kadukkas from south beach (near Thangals Road..Rs.60 for 100) but recently my folks say the best kadukkas are from Telicherry coast. Since tasting that is now left for my next visit home, I stand by the Kozhikode ones for now. The mussels should not be too small or too big and should be raw and fresh, not frozen and not refrigerated. The ones you get in Kerala are long and narrow with blue green shell, while the ones here are a little short and squarish. I have made it with the ones available here too, but they are not as meaty and their shells are very delicate. Still the rice filling gives it its distinctive taste and its good. The following post contains graphic images not suited to vegetarians and those weak of heart. For the true followers, its not easy to explain the method without graphics so if any of you are put off by the sight of mussels, just bear with me. Also, if you don't have to guts to play with raw mussels, don't attempt to make this. Though fish makes me queasy, I have no qualms about mussels and the anticipation of the yummy snack makes it all worthwhile. And last but not the least, the process is a labour of love and requires at least an hour of your valuable time and concentration. If you have company to help you, all the better. Don't attempt this on a day when you are out to prove a point or spoiling for a fight. :) It is bound to go wrong then. And use only parboiled rice, not basmati or any rice you find at home. It will not solidify and will be sticky inside and would absorb a lot of oil while frying. When made properly, the kadukka can be removed completely from the shell and served. The first recipe is using rice flour instead of ground rice, keeping the difficulty of grinding rice in mind. Use coarse rice flour, such as Puttu Podi. 1. Wash the raw mussels properly under running water, scrubbing the surface completely clean. Allow it to drain in a colander. If they are already open, discard them as they are not good. Ideally, they should open slightly and close again when tapped. Use mussels the same day they are bought. Do not refrigerate or freeze and then use them as it changes the taste. 2. Prepare the dough: Grind the coconut, fennel seeds, shallots, green chilies to a coarse paste without adding any water. Boil the water (use exact measurements as specified) with 1/2 tsp salt or to taste. When it comes to a rolling boil, add the rice flour and stir with a long handle of a spoon. (The rice flour should be grainy to approximate the texture of ground raw rice.) Switch off the flame and after stirring completely, cover and let it cool for at least 10 minutes. Open and add the ground mixture and turmeric and red chili powder, chopped curry leaves. Spread into a mixing plate and knead into a grainy but not too dry dough. Add water by spoonfuls if needed to mix well. 3. Chop the onion finely and fry in 1-2 tbsp oil till light brown. Drain the oil and add the onions to the dough and mix thoroughly. Do not add salt liberally as the shellfish already has sea water and hence is a bit salty to begin with. Add a bit less than what you feel is needed. 4. 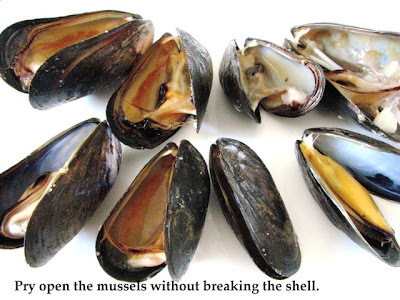 Open the mussels one by one by sliding a blunt knife in thorough the slits and forcing it open. Once open, it won't close again. Take care not to crack the shell. Try to remove the hairy substance at one corner by pulling it out. 5. 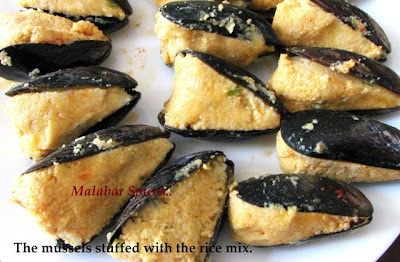 Stuff each mussel with the rice filling and shape neatly. 6. Use a steamer or cooker and steam the stuffed mussels for about 30 minutes. They may look soggy when you take them out but they firm up on cooling. You can store them at this stage for a couple of days in the fridge and fry as needed. These mussels are are from here..
7. Heat enough oil in a cast iron wok (cheenachatti) or deep pan. When the oil is hot, slide in the mussels one by one. Fry them in batches suited to the size of the pan till golden brown. Drain onto paper towels and serve. If made the previous day, they can be reheated in a microwave for a minute or less. Parboiled Rice-2 cups soaked in boiling water for at least 3 hours and then drained. Grind the rice to a paste adding all the other ingredients as before(except the fried onions)but without adding water. This is not easy as you need a wide base grinder equipped to handle heavy duty grinding without water. An electric grinder or a Sumeet or Preethi food processor should be fine. Then add the onions, spices and salt and proceed as above. I would get arikkadukka from the kannur, Calicut friends..Really appreiciate their patience to make such tasty dishes. Yours pictures are looking nice..Thanks for posting the recipe.Don't know will it be a success if I make first time without seeing the art of making it originally..
Wow! How did your parents bring them all the way? Mallugirl, your posts don't seem to show up on the day they're posted - perhaps you're posting them with an older date? I want to so got to Kerala right now! Are they in plenty during the monsoons too? Do they serve this in non-five-star restaurants? Ok..I Was wrong with my guess..But my following guesses are def right..
2.DEF a better cook than her daughter..
5.GET PREPARED THIS IS GOING TO HAPPEN!!! can only sit n drool over ur arikadukka. we do get mussles here, but it has a funny taste,so not worth the effort. convey my rgds to aunty n uncle. Seena: Try it.. its not too hard ..u know how to make pathiri.. this should be a breeze compared to that. Anita:Are u kidding me? non 5 star is the way to eat in calicut.. if u ever go there, i will give u a list of places to visit. let me see ur mom.. have some tough talking to do to her. anon, do try and let me know. ki, conveyed regards.. we were talking abt u..reading some news local to ur area..hope u are fine..
WOWW SHAHEEN,THEY LOOK REALLY YUMMYYY....IS IT YOURS OR UMMA'S WORK? ?GREAT PICTURES!! wwoww... i don't even remember the last time i had this "most amazing interesting wonderful yummy Kadukka". I was in love with it, the first time I had this. And never even bothered to find out the intricate method of preparing this. Hope you are having fun with your mom! omg, that looks exotic.... I haven't seen these in Kerala... will be trying these for sure... thanks for the step-by-step pics. hi..tho i've visited ur blog earlier before i decided one on my own ,i dont think i've ever commented on any of ur posts 'cos i dint know the gen ethics of blogging..this arikadukka is soooo yumm i had to comment on it..what an explanation.! !& that warning was also good & right..tho my mom makes it i personally have tried it..its simply amazing!! The photos are gorgeous and I'm sure the dish is out-of-this-world. Thanks for the lovely post! thank you soooo much shaheen. i was on the look out for this recipe. thank you so much! 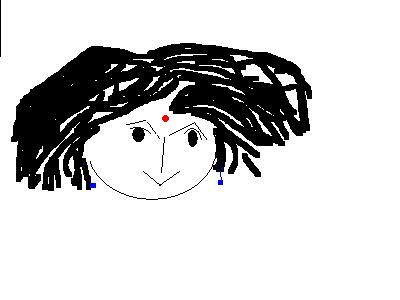 VIji, the first photo are those made by my mom and the others, we made it together here. Jyothsana, yup.. to sit back and eat is fun, right? 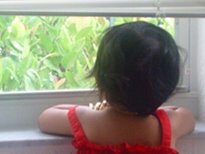 Babli, can u send me ur no again.. i can't find it in my ol mails..please..
SIg, do try.. its not too hard... and ur mom is there for support. linda, so sweet.. hope u make it soon. Inji, make it and let me know..if u find the time..hi hi. I have never ventured to cook Mussels but love eating them. The stuffed Mussels look amazing and tasty I bet. lena, if u have already steamed them , then remove the shells and fry..shallow fry might not be enough.. it doesn't require a lot of oil to fry.. just enough to cover it and then u can move it from side to side. Thank you for bringing a little piece of Calicut wrapped in shells. Made it this afternoon- perfect for a hung-over Saturday. The recipe was perfect and tasted just like how it should be. My girlfriend, who has never had anything like this before, absolutely loved it. I couldn't open the mussels to stuff them , so steam cooked them for two or three minutes-works a treat! I actually was craving for this n my frnd send me this recipe....with NO exaggeration...this is one of the best recipe i tried...it came really yummy n makes me crave for more..
Ingalellarum onnu try chethu nokki!!! this looks awesome! !...I have a small doubt..do we need to boil mussels for cleaning?pls reply..i bought some today and confused with the cleaning process..